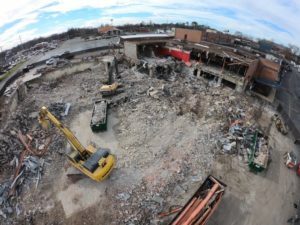 Holladay Properties selected Gobbell Hayes Partners (GHP – CM) and EAI (Demolition Contractor) for the selective structural demolition and building separation of a portion of the Donelson Plaza Complex – East End. The Donelson Plaza was opened in 1961 with Castner Knott serving as its anchor tenant. EAI completed the demolition of the former 3-story Castner Knott as well as building separation and demolition of three adjoining suites to the West. This portion of the plaza consisted of approximately 50,000 square feet of building. EAI performed the structural demolition and building separation in 60 days. The project is 95% completed. Concrete, masonry and steel were diverted from the landfill with the concrete and masonry providing as beneficial re-use. The site is slated for re-development with a new urban town center that will include a new Metro Nashville Branch Library, revised building facades, and a courtyard.